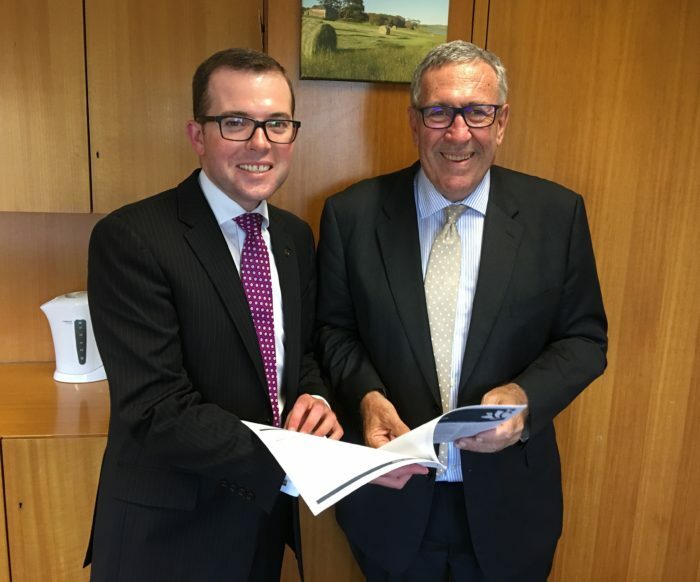 Northern Tablelands MP Adam Marshall met with Roads Minister Duncan Gay this week to push the case for the funding of several roads projects in Moree Plains Shire. MEMBER for Northern Tablelands Adam Marshall has met with Roads Minister Duncan Gay in Parliament this week to push the case for funding for several road projects in the Moree Plains Shire, including a Newell Highway bypass of Boggabilla. Mr Marshall said he was seeking around $700,000 from the Minister to help council with three freight productivity related road upgrades. The MP also used the meeting to start lobbying for a Newell Highway bypass of Boggabilla, a major project which would resolve longstanding road safety and heavy vehicle freight efficiency issues. “Council has identified three local roads that would greatly benefit from upgrades to allow B-Triple heavy vehicle access to the saleyards, grain receival sites and cotton gins,” Mr Marshall said. “The Minister is very keen to target funding toward addressing freight pinch points across country NSW and I’m trying to convince him of the need to fund these local projects to improve freight efficiency in the Moree district. Mr Marshall said that if secured, the funding would be spent upgrading Tapscott Road and Gosport Street, both at Moree, and Rosedale Road in Ashley. “Tapscott Road provides access onto the Newell Highway for the Moree saleyards and a significant cotton ginning and grain receival operation and the upgrade will see a reduction in vehicle trips of around 2,300 per year,” he said. “The improvement of Gosport Street will benefit almost 24,000 tonnes of grain haulage a year and see 280 less vehicles movements annually. Mr Marshall said he was pleased that Minister Gay has asked Roads and Maritime Services to analyse an option of a Newell Highway bypass at Boggabilla. “The Newell currently joins the Bruxner Way at a T-intersection in the middle of Boggabilla and over the years this has caused a number of safety concerns for heavy vehicles and local traffic and the noise of the trucks braking also has a negative impact on local residents,” he said. “A bypass around Boggabilla, sweeping to the west of the township after the truck stop to the south of Boggabilla, would resolve these issues and also allow freight to continue along the Newell Highway more efficiently. Mr Marshall said the Minister confirmed that he would visit the Northern Tablelands, including Moree, in early April.